As the last days of summer come to an end, you will undoubtedly need an Ice-O-Matic ice maker for any cold drink that you may choose to have out in the sun on a hot day, whether on your own or with friends and family at a social gathering. But which one is the best one that suits your needs? Should you prioritize the quality of the machine's functions or the quantity of ice that it produces? We took a look at three different lines of ice maker: the Ice-O-Matic, the Sportsman, and the SPT. To bring you a wider variety of options that you could potentially use, we looked at two different choices under the Ice-O-Matic brand, and we come prepared with information about the product specs and pricing for all four options listed below. We will be primarily focusing on the Ice-O-Matic Elevation Series Ice Maker, our pick for the best of the bunch. What Is The Ice-O-Matic Elevation Series Ice Maker? The Ice-O-Matic Elevation Series Ice Maker is designed to be easy to clean, environmentally friendly, and easy to operate ice maker. It has numerous parts that are dishwasher safe, such as its plastic food zone parts and a removable water distribution tube. Dual exhaust technology allows the Ice-O-Matic Elevation Series Ice Maker to prevent obstruction of air, as it goes out from both the side and the top of the unit. One touch cleaning functions and LED light indicators to make it easy to sanitize the Ice-O-Matic if you need to do so. The Ice-O-Matic Elevation Series Ice Maker is free of parts containing BPA and is 20% more energy efficient. It is easy to install, merely requiring you to plug it in before you use it. Problems are avoided by the LED indicators, and it is as safe as any product for food safety. It is designed to be as simple as possible to make it easy and convenient to make ice for your needs. It succeeds in doing that while also being as convenient and healthy as possible. The Ice-O-Matic Elevation Series can be purchased for around $2,750 from online retailers, including Amazon. There is some variation in prices depending on which model of the Elevation series you choose, so we recommend doing plenty of research to see where you can get the best bargain. 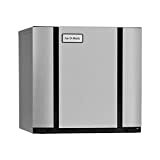 Ice-O-Matic CIM0520HA Elevation Series Modular Cube Ice Maker, 561 lb. The Ice-O-Matic Elevation Series Ice Maker is designed for maximum ease of use, and it succeeds admirably. You only need to plug it in for it to be used, and it takes care of its own ventilation. It also makes it easy to control thanks to its control panel and dishwasher friendly parts. The Elevation Series comes already assembled, and all you need to do is plug it in for your own use. In addition to being attractive with its stainless steel design and smooth surfaces, the design of the Ice-O-Matic Elevation Series is very convenient thanks to the aforementioned "plug and play" quality and its dishwasher friendly components. All products that are sold by Ice-O-Matic come with a warranty that covers parts and labor coverage. Specifications may vary, and you need to actively be purchasing a product in order to learn the details of the warranty. The ICE0500HT is a different product in the Ice-O-Matic line that is designed to produce ice in bulk, specifically 586 pounds of half-sized ice cubes every 24 hours. This makes it a great product for those looking to work in the food industry who may potentially need large quantities of ice. Sold for around $2,783 from online retailers such as Amazon. The ICE0500HT is very simple to use, requiring you only to plug it in and provide the water in order to produce a large quantity of ice over the 24-hour period. It has a harvest assist feature that reduces the amount of energy consumed while also expediting ice production. The ICE0500HT requires no assembly thanks to its simple cube shape that allows it to merely be plugged in and fed water in order to produce its ice. It is as simple as it gets for an ice maker and is designed to be quick and efficient so that you can quickly set it up and then go about your business when running a restaurant or bar operation. Since it is designed for bars and hotels, the ICE0500HT is designed to be unobtrusive and last a long time. The evaporator plate is covered with nickel in order to prevent scratches and corrosion that could potentially be caused by the water and ice. There is also a stainless steel interior and exterior designed to provide protection. The Scotsman Undercounter Ice Maker is primarily designed for commercial use. It can be used both indoors and outdoors, but it is ideally designed to be placed under a counter or a bar for the easiest form of access. It claims to produce gourmet ice, with the final ice produced being clear, uniquely shaped, slow melting, and odorless to ensure that it merely cools your drink without affecting the taste or causing any dilution. Sold for around $1,600 from online retailers such as Amazon. Once assembled, the Scotsman Undercounter Ice Maker merely requires you to plug it in and feed it the water it needs to produce gourmet ice. It does so quietly and efficiently, making it a very easy product to use. While it is primarily designed for people looking to produce high-end ice for the foodservice industry, it is also a good product for impressing your friends at social events that may require ice for their drinks. The product comes preassembled and should work well, but if a part breaks down, it is notoriously difficult to find out which one needs to be replaced, with the website for this product offering a complicated technical breakdown of all the pieces used during the assembly. The Scotsman Undercounter Ice Maker promises quality, with the ice cubes it produces is the best on the market in order to prevent dilution of your drink even in hot weather. It comes highly recommended if you want a top-end product. Most parts of the ice maker are only covered for a year after installation, and the warranty is only offered in certain areas. It also requires any warranty service to involve a Scotsman representative. The SPT IM-600US Stainless Stell Under-Counter Ice Maker is designed to be used primarily for restaurants and bars. It is designed to produce up to 50 pounds of restaurant-quality ice cubes per day. It has front ventilation, removable bins that can store up to 25 pounds of ice, and a reversible stainless steel door with a full-length handle. Sold for around $1,163 from online retailers such as Amazon. Actually using the SPT Under-Counter is fairly straightforward, but the website is very cautionary about how much maintenance it will require in order to keep it clean and with quality ice cubes being produced. To keep it functioning, it recommends using filtered or purified water, which will also produce a better tasting and less obtrusive flavor in the ice cubes. If this is not an option, it must be cleaned every two weeks with citric acid in order to remove the mineral build ups. The instruction manual for this product says that you are required to have 2 people install it, and a certified plumber must be one of them. You will need a certain amount of clear space, but otherwise, the product comes already assembled. Reversing the door will require the use of a screwdriver and some hinge assembly. The SPT Under-Counter tends to draw complaints as to the quality of the ice it makes. When it is finally done producing the ice, the ice usually comes in a sheet form and needs to be manually broken in order to fulfill its use as ice cubes. It also occasionally jams or breaks down, which can lead to flooding under particularly unfortunate circumstances. Customers have complained frequently that the machine only tends to last a few months past the date of warranty, making it a potentially risky purchase. Repairs are covered for free within the first year of purchasing the product, but the warranty does not cover major categories of potential defects like a poorly done installation. Sunpentown, the manufacturer of the SPT Under-Counter, must be notified of the fault and decide independently if what has occurred warrants a free repair. This makes it a somewhat risky warranty. We have come to the conclusion that the Ice-O-Matic Elevation Series Ice Maker is the one to beat as far as this selection of four products goes. If you are looking to produce ice cubes for a restaurant or a bar, then the Ice-O-Matic ICE0500HT Air Cooled 586 Lb Half Cube Ice Machine is probably your best bet just for the sheer quantity of ice that it produces, but most people are not going to need that much ice. If you are looking for high-quality ice, then we recommend the Scotsman CU50GA-1A Undercounter Ice Maker, but it comes with a bad warranty and seems to be primarily designed for commercial use as well. The SPT IM-600US Stainless Steel Under-Counter Ice Maker is too poorly designed to warrant a recommendation. If you are looking for a personal ice maker, then the Ice-O-Matic Elevation Series Ice Maker is clearly the one to beat, and its price is warranted: this does not take away from its quality.